On display at CTIA in New Orleans this week, the VGo is a form of technology called robotic telepresence that allows a user to see, hear, talk and wander around a remote location. Potentially ideal for schools, a classroom equipped with a VGo could allow a sick student to attend a lecture and actively participate in a class discussion. Since the user also has control over how the VGo moves, they could potentially relocate the VGo around a school campus to reach their next class. 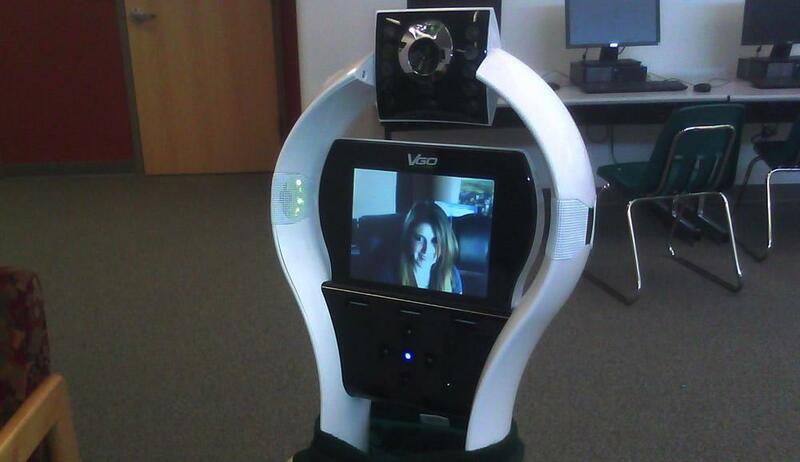 In order to keep the connection to the user in the remote location, the VGo can run on Verizon’s LTE network and doesn’t require a Wi-Fi connection to transmit the constant video feed. To stay charged, the VGo must return to a charging pad while it’s not in use as the standard model has a 6-hour battery life. The user connects to the VGo through an application that’s available for both Macs and PCs. The VGo could also be extremely useful in the medical field or general business. A consulting doctor could check on a patient even if they were a thousand miles away at the time. Family members that cannot afford to fly across the country to see a sick relative could “visit” by connecting to a VGo owned by the hospital. A manager could connect to a VGo at the home office to attend an important meeting or perhaps ship the VGo to a remote office to check up on the operation. One disadvantage to the VGo is that obstacles like stairs and closed doors are impossible to navigate without the help of people in the vicinity of the large robot. There’s also nothing to prevent someone from simply stealing the 20-pound robot if it was moving around a public area. The cost of the VGo is also steep at approximately $6,000 to $7,000. There’s also an additional annual service contract that costs approximately $100 a month and additional charging pads cost about $500. The user can also upgrade the battery to a 12-hour model for an additional $200. Earlier this year, a group of teenagers in Utah helped raise money to purchase a VGo robot for the Primary Children’s Medical Center located in Salt Lake City. Ideal for helping children that are recovering from a serious illness, the patients can attend class while sitting in their hospital bed. The group expects that more robots will be purchased and donated to the medical center as there are 20 to 30 kids at the hospital that would like to attend class at any given time. As detailed by the Wall Street Journal, a high school student at Fossil Ridge High School in Fort Collins, Colorado uses a VGo to attend class due to a severe allergic condition that forces her to stay home. The student’s English teacher houses the VGo within her classroom and has to leave the classroom door ajar to allow the VGo to move around the school. When the VGo gets stuck in a particular area or runs out of power, the student has to email her English teacher in order to get the robot moving again.